Secrecy. Greed. Dishonesty. Self-dealing. Neglect disguised as concern. Contempt for democracy. If one were asked to describe the most notable hallmarks of the administration of President Donald Trump, it would be hard to come up with six more accurate characterizations. Back in 2015 when Trump was first running for the Republican presidential nomination, it was easy to find prominent North Carolina conservatives who could foresee and would publicly acknowledge the threat that Trump posed to the very fabric of the American experiment. Today, tragically, less than three years later, that’s all ancient history. In 2018, not only has the North Carolina conservative movement embraced Trumpism, it is now in the process of aping all of the most shameful features of Trump’s loathsome approach to governance. 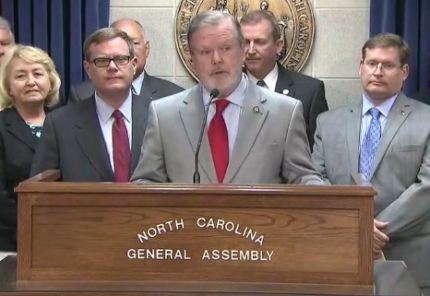 To see the latest concrete confirmation of this appalling state of affairs, North Carolinians need look no further than the preposterous state budget bill that Republican legislative leaders rolled out yesterday. Faced with the distinct likelihood of losing their legislative supermajorities at the polls this fall, Senate leader Phil Berger and House Speaker Tim Moore appear to have opted for what can only be described a scorched earth approach to lawmaking. Whether it’s yet another round of tax giveaways to the rich, the continued underfunding of public schools and early childhood education, new assaults on environmental protection and public transit, the shocking neglect of school safety, dozens of outrageous pork barrel giveaways to favored special interests or just the absurd lack of process that accompanied it, the new 2019 budget is an example of Trumpism at its absolute worst. At a time of great economic growth for the wealthy and profitable corporations, the budget continues yet another round of income tax giveaways to those same groups and takes overall state investments to a depth not seen since the mid-20th Century. Despite massive public support for real change, overall K-12 funding remains woefully inadequate and will increase by just 0.6% — with virtually all new dollars going to teacher pay increases. Meanwhile three-fourths of the largest education allotments (e.g. text books and supplies), remain below their pre-Recession levels of a decade ago when adjusted for inflation and student growth. Lawmakers promised to address school safety issues in the aftermath of recent tragedies, but instead, the budget says nothing about gun safety and appropriates just $10 million in one-time money for school mental health professionals – just 1.5% of what it would take to meet industry standards for the appropriate ratios. Instead of using newly available federal funds to expand the state’s threadbare and waiting list-plagued early childhood education program, budget writers instead used the new funds to supplant existing state funding that was then redirected elsewhere. The budget tosses a relative pittance to the decimated state Department of Environmental Quality even as lawmakers issued new demands on the agency. Meanwhile, the budget bestows millions on an unaccountable environmental research project foisted last year upon the University of North Carolina and headed by a former staffer of Senator Berger. And so, quite tragically, it goes as one wends one’s way through the budget behemoth. In area after area, healthy sums are doled out to favored (often bizarre) special interests at the same time that dozens of essential public structures and services are patronized with mere lip service or less. The budget even cuts funding to the state’s suicide prevention hotline! But, of course, in the end, nothing renders the new proposal more fully “Trumpian” than the utter and outrageous lack of process. Like the would-be despot in the White House, legislative bosses are either so afraid of real debate or so utterly disinterested in democratic process that they have decided to use a parliamentary maneuver to prevent members of either party from even offering amendments to the proposal. The budget and the tactics accompanying it are, in other words, cut from the same political cloth one would expect to see on display from Trump’s patron in the Kremlin rather than the kind associated with a functioning western democracy. About all one can say about the budget is that caring and thinking people now know – as they do at the national level – where things really stand.